In news I never thought I'd write, there are now pedestrian crossings at the Bow Roundabout. 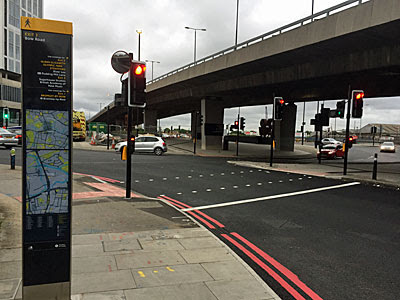 And that's proper push-button crossings, crossings which will stop the traffic whilst providing a safe route from one side of the roundabout to the other. After more than 40 years of waiting, hoo-bloody-rah. But the layout is counter-intuitive, indeed somewhat of a maze, so what's yet to be seen is if local pedestrians will actually use them. Previously crossing the roundabout on foot meant negotiating the perimeter. The four main entry roads had traffic lights but not pedestrian signals, and so were relatively safe. But the four exit roads had no aids to crossing whatsoever, and required situational judgement to decide whether any of the traffic currently on the roundabout was about to turn off, hence were potentially very dangerous indeed. Five years ago it was deemed impossible to add pedestrian crossings without inordinately slowing down the traffic. But TfL thought again, adopting a novel solution involving the centre of the roundabout, and in February last year announced new plans. 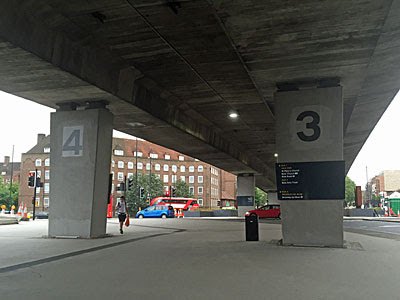 Five signalled pedestrian crossings would be added, connecting to a spine route running underneath the flyover, with two further crossings to link across the roundabout itself. For those crossing Bow Road it's no great change to the route they'd have taken before, only safer. For those crossing Stratford High Street it's much the same, but with a choice of two crossings on the southern side according to which way they're heading. But for those crossing the A12 it means using four crossings whereas previously it'd have been two, and that's where the potential for complete disregard springs up. To try to make sense of the new layout, TfL have numbered the five exits from 1 to 5. They've done this on the maps that have gone up beside each crossing point, and on giant black boards listing destinations you might be trying to reach. Cleverly they've also painted giant numbers on the supports holding up the flyover, although because they're black on grey they're less obvious than you might think. Engineers have been working on the new layout since January, adding new traffic light poles and laying a new surface beneath the flyover. I don't quite understand how the work has taken six months, but I suspect the electricals were quite complicated, and a lot of digging and reshaping has been going on. And late yesterday morning they finally took the covers off, and powered-up the buttons, and the Bow Roundabout had its very first safe crossings. Some suits came out to oversee the opening, as all the cones and barriers were rapidly swept away. 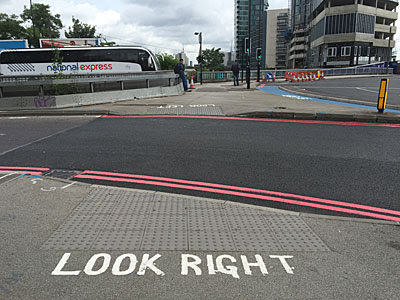 But afterwards the overseeing of events was turned over to a group of hired staff in pink tabards, whose job it was to inform pedestrians attempting to cross the roundabout that there was now a different way to do it. This involved wandering over to say hello, and explaining the fundamentals, and handing over a colour printout of the Bow Vision interim scheme design. This complex blueprint depicts all the changes that have been made, including "Planter adjusted to improve pedestrian accessibility", but doesn't mention anywhere the system of five numbered exits now emblazoned all around. I'd say the handout wasn't really fit for purpose, merely a regurgitation of a planning document at minimal cost. And by no means everybody attempting to cross the roundabout was informed. In particular, those attempting to cross the A12 via the two old crossings missed out, with no attempt made to shepherd them onto the new approved path. And so they continued to use the unsafe route, in this case out of ignorance, but perhaps also because it's a lot quicker. You can be across the old crossings in thirty seconds flat, whereas the four-stage process takes four lots of waiting for the lights to change, assuming you can be bothered to wait and don't just dash through a gap in the traffic. It's interesting to note than only three of the seven push-button crossings are actually push-button controlled. Traffic always stops at Exits 2 and 4, and at the two links to the centre, as part of the roundabout's normal signal cycle. The red man turns to green and then counts down whether there's anyone there to press the button or not, indeed you could have crossed safely this way before, apart from not quite knowing when the traffic was about to restart. 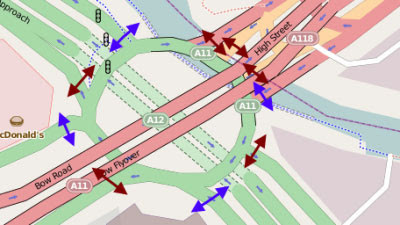 But the crossings at Exits 1, 3 and 5 do genuinely work, halting the traffic only if pressed, and it's these which will make the average drive through the Bow interchange a bit slower than before. Having these odd-numbered crossings is great, but a lot of the time the button-pushing isn't going to be necessary. I know this sounds ludicrous at a busy killer roundabout, but the waves of traffic heading off the roundabout often leave big obvious gaps it's very easy to take advantage of. I've already watched good citizens press the button at Exit 1 and wait, and then look at each other, and then walk across lugging a suitcase behind them, all in perfect safety, then being several yards away when the lights finally change, bringing cars, buses and bicycles to a halt. Interestingly their button-push took a whole minute to hit red, whereas on a subsequent occasion it took only five seconds, suggesting that these pedestrian lights are hardwired into the general timing cycle of the roundabout. What's properly excellent is that it's finally possible to cross the Bow Roundabout on foot safely for the first time. That's particularly good news for those a little slower on their feet, or those with small children and pushchairs, or those who get around in wheelchairs or mobility scooters. Previously every crossing would have involved dicing with death, and now it needn't, which genuinely helps to link the communities in Bow and Stratford together. Given that five years ago this was deemed impossible, it's even more impressive. But more able-bodied locals aren't necessarily going to use the facilities. They've grown used to crossing where and when they like, and aren't easily going to be constrained to routes that don't match desire lines. At Exit 2, for example, people are going to cut across immediately in front of the main traffic lights rather than walking all the way past the cycle early start zone to use the new crossing, just as they've grown used to doing over the last couple of years. And more comprehensively, those crossing the A12 are going to want to go the quick way rather than the four step detour... so TfL have plans to stop them. The final stage of the Bow Roundabout upgrade is the removal of the old crossings, which'll be taking place over the next couple of weeks. TfL haven't said how they intend to do this, but they'll have to go a bit further than removing the dropped kerbs to persuade people from using them. That might mean barriers, it might mean hard-to-walk-on cobbles, or it might be a token gesture that'll be easily got round. What I do find genuinely astonishing is that TfL only got round to painting LOOK LEFT and LOOK RIGHT on the pavement at these crossings two months ago, something that could have been done decades back, and which will now be erased less than a fortnight hence. When all this final work is complete, one of the immediate upsides should be the reinstatement of buses on route 25 to their original path. 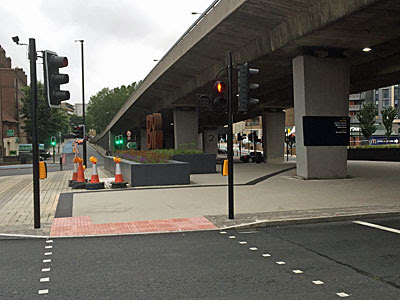 The 25 was diverted across the flyover in March last year, to make up time lost to roadworks due to the CS2 upgrade, and this diversion has been maintained while the roundabout has been modified. 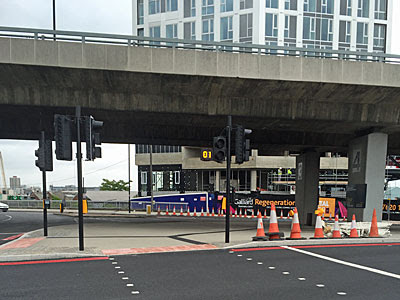 But a consultation proposal to make the rerouting permanent failed in March, with TfL promising that "Route 25 will return to run via Bow roundabout as soon as the current major roadworks on the route are complete." Residents living near the Marshgate Lane stop eastbound, and Bow Flyover stop westbound, look forward to that promise being kept. 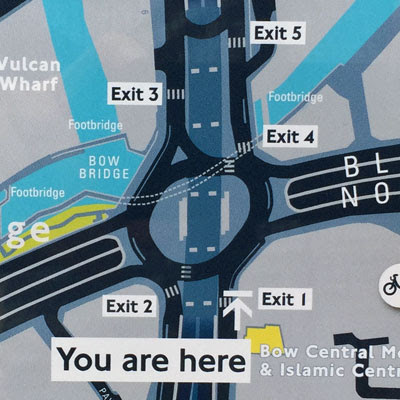 But just to reiterate the magnitude of what's just happened, the Bow Roundabout opened over 40 years ago, and in all that time there's never been a safe way to cross on foot from one side to the other. And now there is. Enjoy the next couple of years of stability while you can, because TfL's long term vision is to remove the roundabout altogether, with another consultation due later this year and a very tentative start date of October 2018. Until then, cross safely.